Building real systems means caring about quality control, robustness and correctness. With the right quality assurance mechanisms in place, well-written code can feel like a precision machine, with all functions performing their tasks exactly as specified. There is no sloppiness around the edges, and the final result can be code that is self-explanatory, obviously correct -- the kind of code that inspires confidence. In Haskell, we have several tools at our disposal for building such precise systems. The most obvious tool, and one built into the language itself, is the expressive type-system, which allows for complicated invariants to be enforced statically — making it impossible to write code violating chosen constraints. In addition, purity and polymorphism encourage a style of code that is modular, refactorable and testable. This is the kind of code that just doesn't go wrong. Testing plays a key role in keeping code on the straight-and-narrow path. The main testing mechanisms in Haskell are traditional unit testing (via the HUnit library), and its more powerful descendant: type-based “property” testing, with QuickCheck, an open source testing framework for Haskell. Property-based testing encourages a high level approach to testing in the form of abstract invariants functions should satisfy universally, with the actual test data generated for the programmer by the testing library. In this way code can be hammered with thousands of tests that would be infeasible to write by hand, often uncovering subtle corner cases that wouldn't be found otherwise. In this chapter we'll look at how to use QuickCheck to establish invariants in code and then re-examine the pretty printer developed in previous chapters, testing it with QuickCheck. We'll also see how to guide the testing process with GHC's code coverage tool: HPC. To get an overview of how property-based testing works, we'll begin with a simple scenario: you've written a specialised sorting function and want to test its behaviour. For the 100 different lists generated, our property held — great! When developing tests, it is often useful to see the actual data generated for each test. To do this, we would replace quickCheck with its sibling, verboseCheck, to see (verbose) output for each test. Now, let's look at more sophisticated properties that our function might satisfy. Good libraries consist of a set of orthogonal primitives having sensible relationships to each other. We can use QuickCheck to specify the relationships between functions in our code, helping us find a good library interface by developing functions that are interrelated via useful properties. QuickCheck in this way acts as an API "lint" tool — it provides machine support for ensuring our library API makes sense. Note that we had to change the type of the property from being a simple Bool result to the more general Property type (the property itself is now a function that filters non-empty lists, before testing them, rather than a simple boolean constant). Another technique for gaining confidence in some code is to test it against a model implementation. We can tie our implementation of list sort to the reference sort function in the standard list library, and, if they behave the same, we gain confidence that our sort does the right thing. This kind of model-based testing is extremely powerful. Often developers will have a reference implementation or prototype that, while inefficient, is correct. This can then be kept around and used to ensure optimised production code conforms to the reference. By building a large suite of these model-based tests, and running them regularly (on every commit, for example), we can cheaply ensure the precision of our code. Large Haskell projects often come bundled with property suites comparable in size to the project itself, with thousands of invariants tested on every change, keeping the code tied to the specification, and ensuring it behaves as required. Testing individual functions for their natural properties is one of the basic building blocks that guides development of large systems in Haskell. We'll look now at a more complicated scenario: taking the pretty printing library developed in earlier chapters, and building a test suite for it. The library itself is implemented as a set of functions that build and transform values of this document type, before finally rendering the finished document to a string. So let's now write a generator for all the different variants of the Doc type. We'll start by breaking the problem down, first generating random constructors for each type, then, depending on the result, the components of each field. The most complicated case are the union and concatenation variants. Looking at the output we see a good mix of simple, base cases, and some more complicated nested documents. We'll be generating hundreds of these each test run, so that should do a pretty good job. 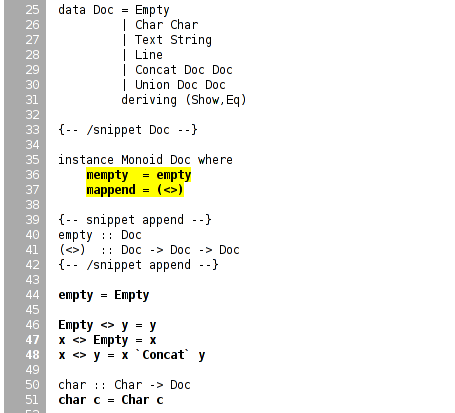 We can now write some generic properties for our document functions. To look at what actual test documents were generated (by replacing quickCheck with verboseCheck). A good mixture of both simple and complicated cases are being generated. We can refine the data generation further, with constraints on the proportion of generated data, if desirable. Other functions in the API are also simple enough to have their behaviour fully described via properties. By doing so we can maintain an external, checkable description of the function's behaviour, so later changes won't break these basic invariants. These properties are enough to fully test the structure returned by the basic document operators. To test the rest of the library will require more work. A total of 1400 individual tests were created, which is comforting. We can increase the depth easily enough, but to find out exactly how well the code is being tested we should turn to the built in code coverage tool, HPC, which can state precisely what is going on. HPC (Haskell Program Coverage) is an extension to the compiler to observe what parts of the code were actually executed during a given program run. This is useful in the context of testing, as it lets us observe precisely which functions, branches and expressions were evaluated. The result is precise knowledge about the percent of code tested, that's easy to obtain. HPC comes with a simple utility to generate useful graphs of program coverage, making it easy to zoom in on weak spots in the test suite. Not too bad. Clicking through to the pretty module itself, we see the actual source of the program, marked up in bold yellow for code that wasn't tested, and code that was executed simply bold. HPC ensures that we're honest in our testing, as anything less than 100% coverage will be pointed out in glaring color. In particular, it ensures the programmer has to think about error cases, and complicated branches with obscure conditions, all forms of code smell. When combined with a saturating test generation system, like QuickCheck's, testing becomes a rewarding activity, and a core part of Haskell development. Throughout this chapter we'll use QuickCheck 1.0 (classic QuickCheck). It should be kept in mind that a some functions may differ in later releases of the library. The class also defines a method, coarbitrary, which given a value of some type, yields a function for new generators. We can disregard for now, as it is only needed for generating random values of function type. One result of disregarding coarbitrary is that GHC will warn about it not being defined, however, it is safe to ignore these warnings.